Reel mounted on a cart, for transporting and storing a garden hose. 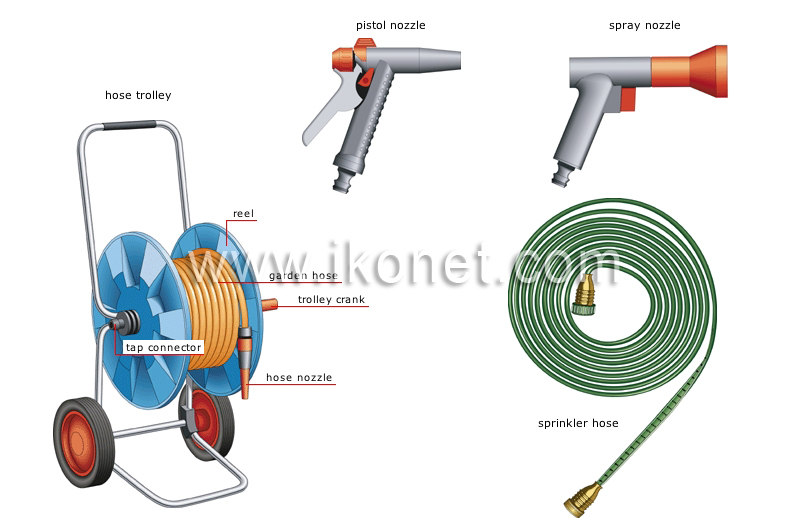 Detachable instrument attached to the end of a garden hose, for adjusting the shape and flow of the water spray. Handle for rolling up the garden hose on the reel. Circular pipe, flexible or semirigid, conducting water from a tap to a watering device such as a nozzle, gun or sprinkler. Spool for quickly rolling and unrolling a garden hose. Threaded part receiving a hose connected to a tap. Hose with small openings through which water flows; placed on the ground, it deeply waters large areas. Watering nozzle activated by means of a trigger flow switch. Watering gun with a wide head that contains small holes, used for watering flowers and delicate plants with a fine shower.